Waste water disinfection is a stage of the purification process, which will assume an ever increasing importance, especially in relation to the final destination of the treated water. In fact, traditional processes of sewage treatment do not provide a complete elimination of the infectious risk of waters that leave the treatment plants, while legislation, still lacking, prescribes, as microbiologic parameters, more and more restrictive limits in relation to the final receptor. The Italian reference law for waste water effluents (Law N° 319, dated 05/10/76 or “Merli Law”) does not provide for specific obligations for disinfection and leaves to local competent Authorities the control of the applications of limits related to microbiological parameters (see Table 12), when requested by actual uses of the effluent waters (for example for drinking, bathing, irrigation). In the case of discharge of waters used for bathing, the European Community regulation (EC Directive No. 76/169) for bacteria provides for a maximum value of 2,000 Total Coliforms/100 ml and of 100 Faecal Coliforms/100 ml, while Italian Regulations (Law No. 319/76) establish a limit between 2 and 20 Total Coliforms/100 ml, for water to be used for irrigation, depending on the type of crop concerned (Appendix 5, CITAI Deliberation of 02/04/77). 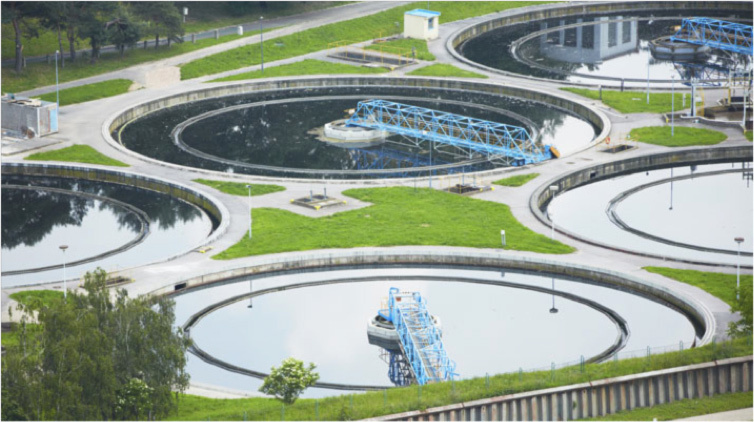 In the disinfection of waste waters, chlorine dioxide has many advantages over chlorine. In the case of chlorine dioxide, in fact, the presence of considerable quantities of ammonia and organic substances in waste waters induces a consumption of disinfectant with formation of chloramines which have a bactericidal effect up to 80 times lower than that of free chlorine. Furthermore, when reacting with organic substances, chlorine produces halogenated organics (AOX), which may accumulate in the environment and pollute the waters with very important consequences in cases when the treated water will be reused for irrigation purposes. Chlorine dioxide, instead, does not react with ammonia, creates limited quantities of halogenated organics in the presence of organic substances, oxidizes phenols, is active over a wide pH range, forms a measurable residue which can be used for automatic dosage, and lastly, does not usually require a subsequent phase of de-chlorination (with sodium bisulphite, for instance). The bactericidal and virucidal effectiveness of ClO2 allows it to be used even in the treatment of hospitals waste water for which, given their great health hazard, the “Water Environmental Protection Governmental Committee” of February 4, 1977 states a mandatory disinfection. Given the wide chemical and biological variability of waste waters and the different possibilities of purifying treatments to which they may be subjected, the dosage of chlorine dioxide may vary considerably depending on the following parameters: suspended solids, bacterial content, organic carbon content (TOC), temperature and pH. In waters that have undergone a tertiary treatment and have a content of dissolved organic carbons (DOC) and suspended solids of less than 10 mg/l, in the presence of an adequate mixing phase, approximately 1.5 - 2 mg/l of ClO2 are generally necessary with a contact time of even less than 15 minutes, so that the microbiological limits of Italian Law may be complied with. Under these conditions, the dosage represents approximately 20 - 30 % of the ClO2 demand. In the case of hospital waste waters that may contain a large number of microorganisms responsible for serious infections, the dosage can reach 10 mg/l.